ATD Dallas Chapter - Technology SIG: Software Simulation Slugfest - Which Tool Should You Use for Your Simulations? 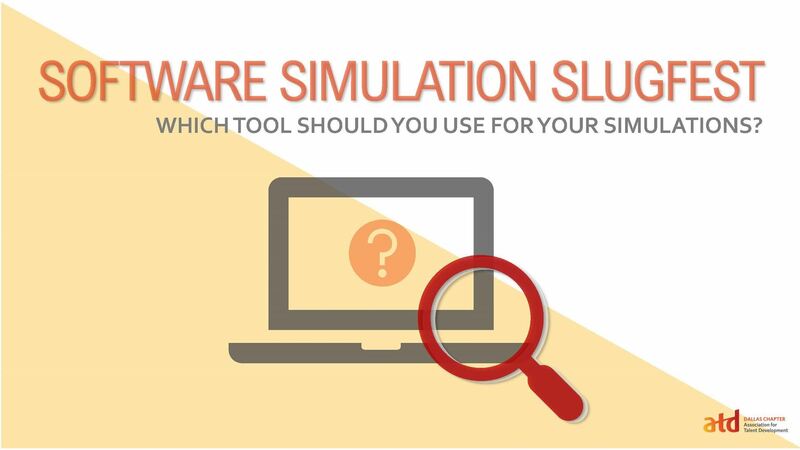 Technology SIG: Software Simulation Slugfest - Which Tool Should You Use for Your Simulations? All three of the major eLearning tools – Camtasia, Captivate and Storyline - allow you to create some form of software simulation. The question is, which is the right tool for your application? Sometimes you have to work with what you’ve got. Or sometimes, you find yourself in the lucky position to choose a new tool. In this session, we’ll look at the pros and cons of the three different tools, including a sample workflow for each project. Michele Wiedemer is a freelance B2B learning designer for customer success. She helps businesses- especially SaaS- create content that educates and engages customers and prospects. She turns technical and complicated processes and procedures into text that users can understand. She designs and produces simple, affordable how-to videos as the scalable alternative to one-to-one tutoring. And she designs and develops eLearning for additional industries in both Captivate and Storyline. She’s passionate about productivity, education, creative problem solving, and using the right tool for the job.